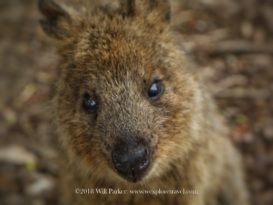 Amazing Rottnest, equisite beaches & Quokka’s that delight. 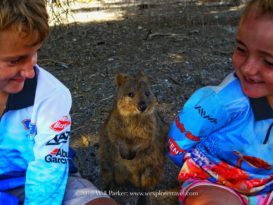 The beaches are stunning, however, it’s these little critters that will leave you with a lasting memory of Rottnest. From the mainland, the island “is so close yet so far”. Take the passage across, only a short trip it be, you’ll be whisked away, feeling a million miles from everything, be tempted you’ll see. 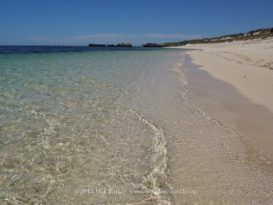 Bobbing around in the Indian ocean just off Perth is a fabulous jewel boasting 63 beaches and 20 bays all pristine just a short cycle away. Doesn’t matter how far you ride or how many bends you round, no filters required, this island is “Wow”. 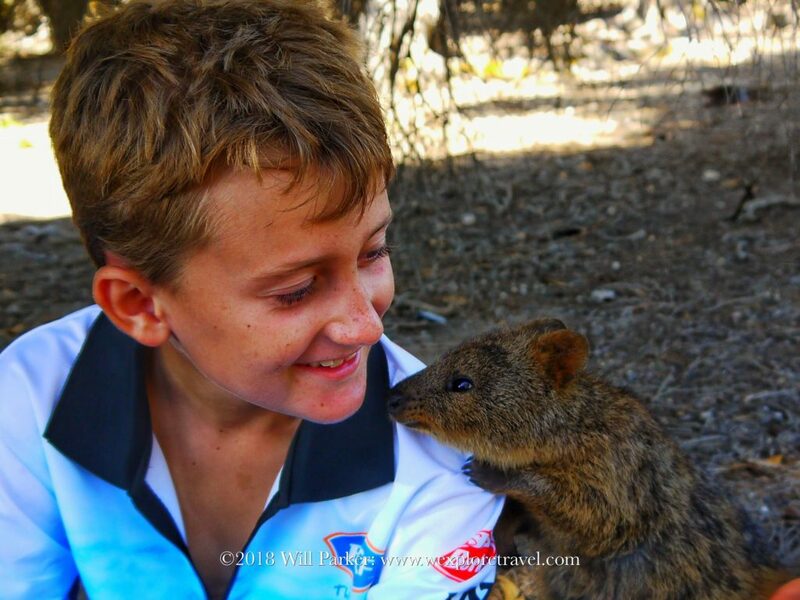 All the while be welcomed by many of the earth’s most renowned-happiest little creatures, you won’t be able to help yourself, you’ll have more than one go, a #quokkaselfie will be your most treasured memory. I got a secret! Would you like to hear it? So many words, they all describe the beauty the overwhelming relaxed vibe. To fully understand you must put your feet in the sand, stop for a while – take it all in. 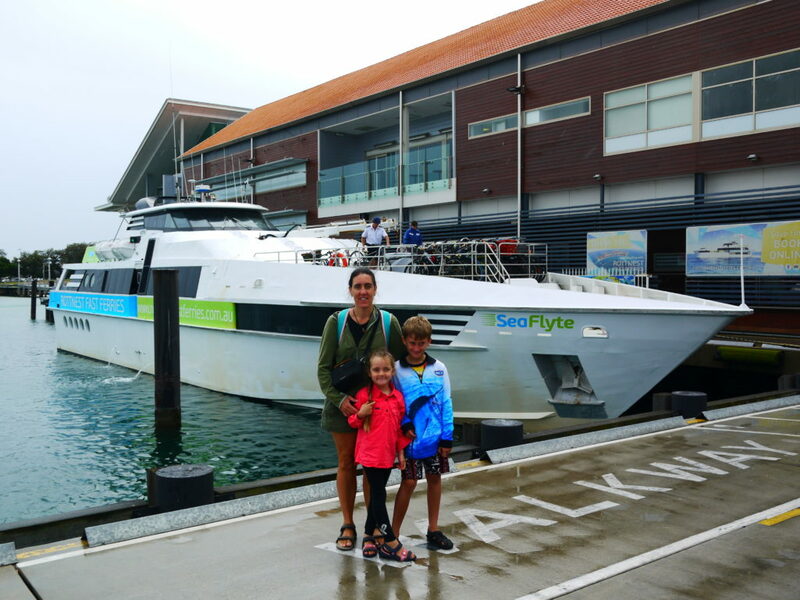 You can get to Rottnest by air, private boat or by far the most popular way fast ferry. Fast ferries leave from three locations around Perth. We departed from Hillary’s boat harbour. If you are going just for the day there is plenty of parking. 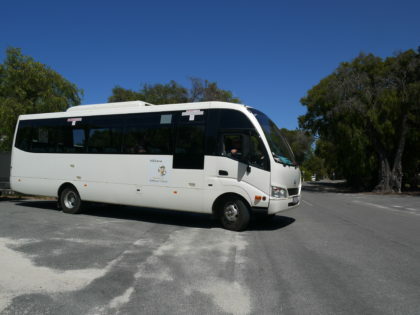 If you are planning a longer stay on the island, Rottnest Fast ferries http://www.rottnestfastferries.com.au have a free shuttle service from the CBD. 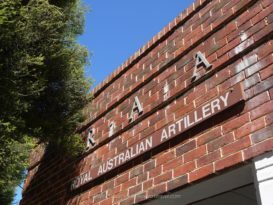 Alternatively, you could stay at the Karrinyup waters resort caravan park which is only a short taxi ride away. The first thing you have to decide is how long you are going for. Will it be a day trip or an extended stay, overnight, two or three days, perhaps a week? 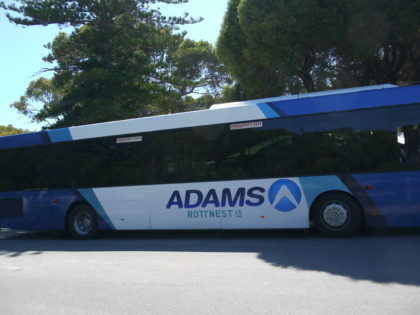 Let me start by saying, Rottnest is not the cheapest place to go on holiday. However, there are options and with a bit of planning in advance, it is achievable. 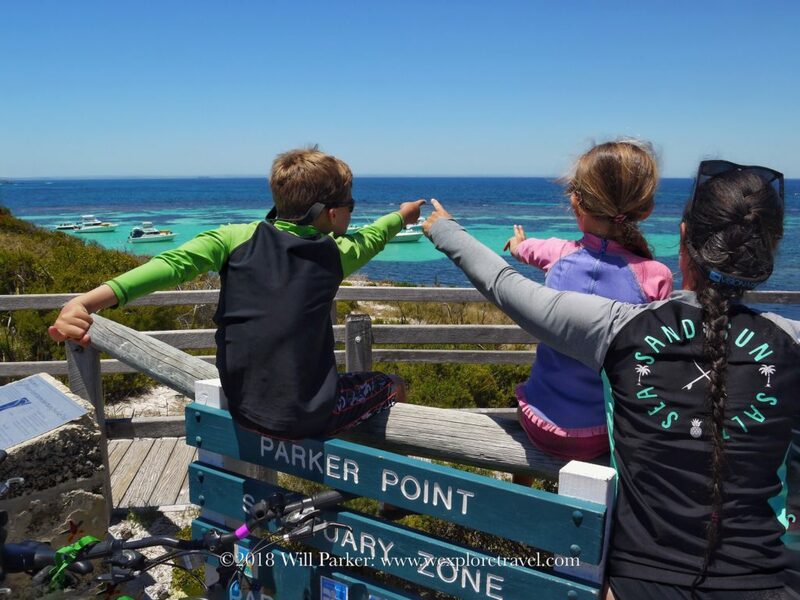 Rottnest is built for families. For everything you want to do as an adult, there is an option for kids or families. 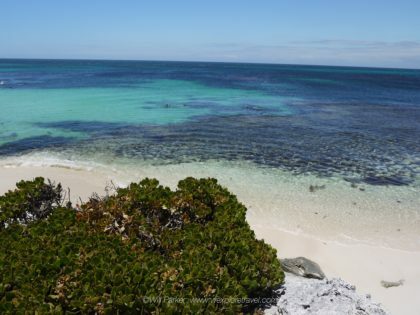 With so many options on offer, it’s a case of seeing Rottnest or experiencing Rottnest. If you are budget conscience or time poor a day trip is a wonderful option. Catch the first ferry across in the morning and make sure you’re on the last one out at the end of the day, this will give you maximum time to see what interests you. 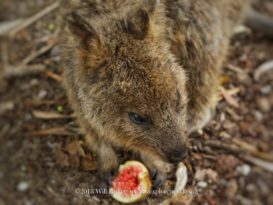 There is so much to do once on Rottnest and some of it you’ll enjoy so much you might want to have a second go. Travelling with kids it’s always nice not to have the worry of rushing and factoring in some time out time. 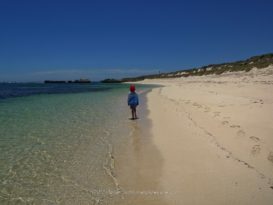 Rottnest does timeout time really well. However, I fully understand – I get it, time is money and accommodation’s not cheap. 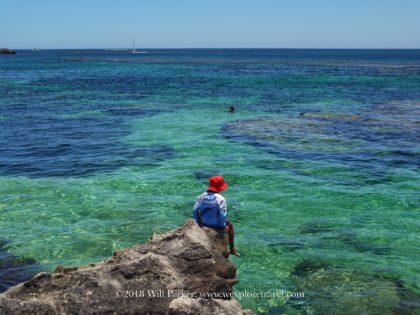 Everybody wants to go to Rottnest in the summer school holidays, fair enough too, it’s probably the time when everybody has the most time off and the weather is warmest. However, the key to a better deal is planning and lots of it, the further in advance you book the better. If possible avoid school holidays and weekends. Instead of January, maybe December or February. Perhaps even March, October or November. Midweek is always better than weekends, Tuesday through Thursday or Friday. Keep a close eye on events. 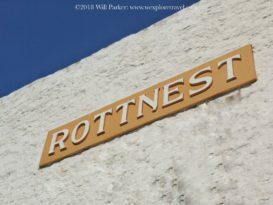 Rottnest hosts many over the course of the year, http://www.rottnestisland.com/whats-on unless they interest you avoid them. 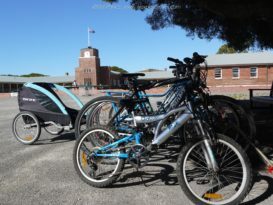 On our recent trip, we stayed at the Kingston Barracks Hostel http://www.rottnestisland.com/accommodation/accommodation-types/basic-accommodation, located an easy 1.5km bike ride around Thomson Bay from the settlement. 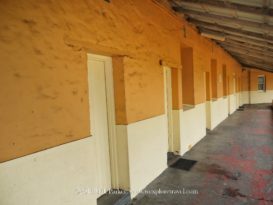 Each section of Barracks has dorm rooms. Ours was in here. Plenty of bike parking & riding space. Our family sized dorm was more than adequate and very comfortable. With shared amenities nearby and a great kitchen area, it had everything you needed. A communal lounge – TV room and many tables and benches scattered around, it also had a nice BBQ area. The large parade yard in the middle gave the kids loads of room to ride their bikes and there was always someone around to have a yak to. Our Dorm cost us $120 per night from memory and we stayed 7 nights, this included linen and towels. 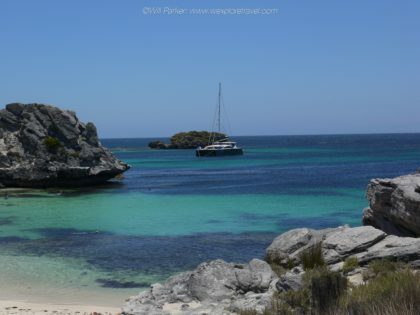 Rottnest is too big to walk around, especially if you’re only there for the day. 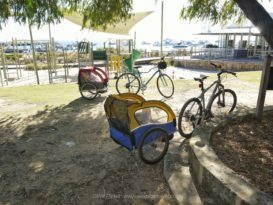 Are a great fun way to get around Rottnest, the island is not huge in distance and for the most part is flat. However, be aware there are some hills and many steep inclines, ”younger-smaller kid’s” or the, ”not quite as fit as I thought I was” adult will find challenging. You can bring your own bike should you have one, alternatively you can hire, either way, there are costs involved. If you’re bringing your own it will work out much cheaper, however, be aware they are charged as excess luggage on the ferry. 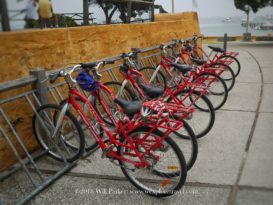 If you choose to hire, Top Tip: organize bike hire at time of booking ferry or accommodation as you can obtain a discount. Be aware this is only on adult bikes, kids bikes cannot be pre-booked and have to be collected/hired once on the island. There is a $100 deposit per bike hired so be prepared for the initial outlay, you will get this deposit or bond refunded when you return the bikes in good working order. Got little ones who cant ride? Perhaps a bit of gear. Great option. This is the option for those who don’t think cycling is for them or who don’t think they’ll make it around the island on the old deadly treadly. This bus leaves the settlement on the half-hour, it continuously circuits the island. You can hop on and off the bus as many times as you like at designated bus stops. There is a cost to this service and it’s charged on a daily basis. When you get off the ferry you’re in Thomson Bay and on the doorstep of the settlement. 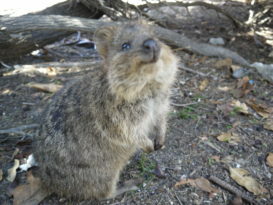 If you plan to walk during your time on Rottnest and you’re of average to good fitness you will be able to see a bit. Two, perhaps two & half kilometers to the north or south of the settlement will get you looking at some beautiful scenery. To the south wander around Thompson Bay to Kingston Barracks, once an Australian army barracks now dormitory accommodation. To the north, The Basin is very achievable along with Pinky’s beach and Bathurst lighthouse. And of course, the history and heritage of the settlement will fascinate. Part of Vincent Way. Australia’s oldest unchanged street. Yesterday a Jail-The Quad, today accommodation. The old salt works building, welcomes you. 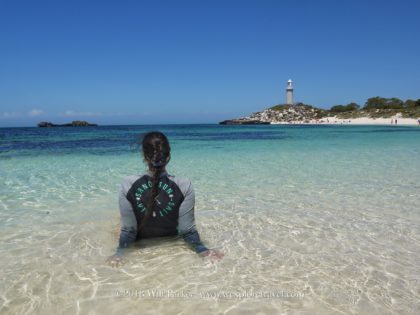 If you’re travelling, and are anything other than a Perth local, then chances are you will need to source some gear for your time on Rotto. 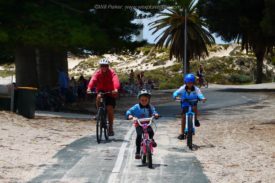 Bikes and snorkelling, equipment can be hired on the island at Rottnest Pedal and Flipper. These guys will deck you out and load you up with everything you’ll need. Be aware it all comes at a cost and the cost might set you back on your heels a little. The best advice I can give is to plan, long before you arrive on the island. Are you staying for a day, three days or a week? Just a day, “Cool”. When you book your ferry ticket book your bike & snorkelling gear too as a package, discounts can be obtained. Staying a few days, “You’ll love it” book your bike when you book your accommodation to receive a discount. Top Tip: Remember, earlier tip. Kids bikes can’t be pre-booked & you’ll be required to part with a deposit so factor it into your costs. However, hold off with the snorkelling gear, it would work out quite costly to hire for your entire stay, there would be periods of time where you wouldn’t be using the gear so its wasted money. Dedicate one day of your trip to snorkelling and check out as many places as possible. 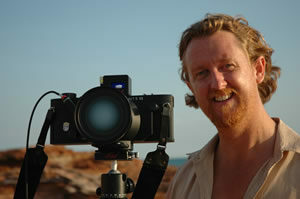 Hiring the gear for the day. Go to Kmart or BigW prior to leaving Perth and pick yourself up a cheap set that will get you amongst the action. 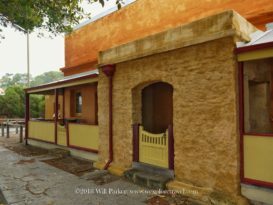 The Rottnest Island general store in the settlement precinct has a selection of gear at various prices, you will find something cheaper than the cost of a day’s hire charge. There is so much choice, spoilt for options you’ll be. These were our favourites, they were all safe for the kids, crystal clear with lots of sand to play on. The Basin is easily reached from the settlement either on a bike or by foot, crystal clear pools of water with mostly gentle gradients. 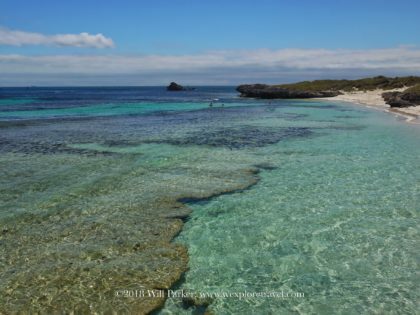 Main swimming area beautifully protected from swell by a reef, a great place for the beginner snorkeler in the family to have a bash. 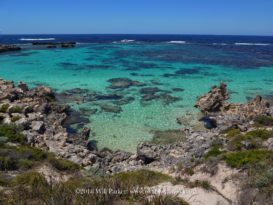 Enjoying the view, The Basin – Rotto. Pinky’s Beach is also easily reached from the settlement either on a bike or by foot. It’s nestled in behind the camping ground, access is gained by walking through the campground. This beach is a nice little sweeping bay, with a long sandy beach, a rocky headland at one end and the Bathurst lighthouse at the other. The water is a delight and another great place for the kids. Beauty at Pinky’s on Rotto. Little Parakeet Bay This little bay is a little bit further away, it’s the next one along after Geordie Bay. It’s achievable by bike and has its own bus stop. This place is not as big as the first two I mentioned and space on the sand on a warm summer’s day could be a little limited. however, the swimming and snorkelling are great, especially for kids. A Beautifully protected little bay for swimming. All three of the above-mentioned swimming beaches are on the north side of the island and by and large, on most days are relatively protected from the wind. 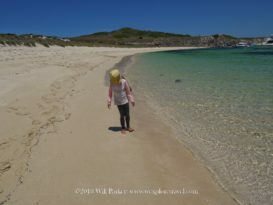 Little Salmon Bay is a most delightful place, it is extremely beautiful. The swimming is great, however if the kids go for a snorkel here keep a close eye on them. It’s deeper and a lot more open. Sand is at a premium here, as beautiful as the water is the sand is prized sitting space. This beach faces the south so it gets quite a bit of breeze. Pick your day and perhaps get there early before sea the breeze picks up. 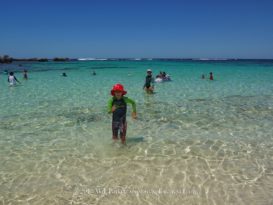 Fun at the beach on Rotto. The clarity & colour is incredible. The Parker’s point at Parker point. 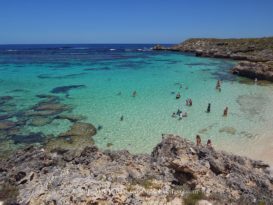 Most of the marked snorkelling beaches on Rottnest Island have snorkelling trails. Underwater mud maps which you can follow, all points of interest are numbered so you know where you are and what you have seen. It’s a great idea and initiative as it gives a point of interest, a little direction and depending on the age of your kids a goal to achieve. My eight-year-old did not find everything however, he had a ball trying. 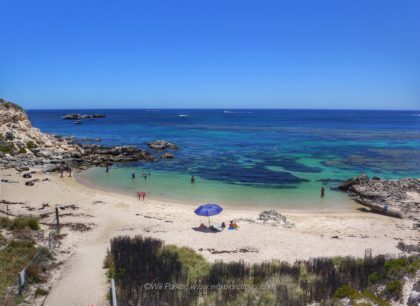 The Basin is by far the most protected and safest place to have a go at snorkelling. Early morning at The Basin. Little Armstrong Bay has lots to explore at varying distances from the beach. On a nice day or before the wind blows up the clarity of the water is superb. If your kids are good swimmers, in the company of an adult this place has lots to offer and well worth a go. Go find your snorkelling adventure. Little Salmon Bay is a most delightful place, it is extremely beautiful. The swimming is great. However, if the kids go for a snorkel here keep a close eye on them. It’s deeper and a lot more open. Sand is at a premium here, as beautiful as the water is the sand is prized sitting space. This beach faces the south so it gets quite a bit of breeze, pick your day and perhaps get there early before sea breeze picks up. 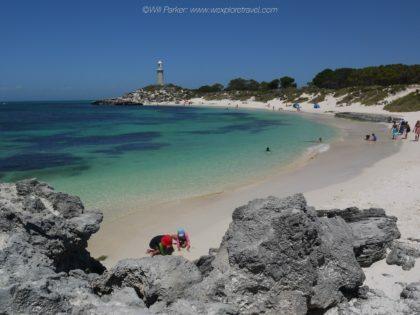 There are many activities that can be undertaken while staying on Rottnest Island, and although all of them would be worthwhile and fun they all come at an extra cost, all of which tend to add up. 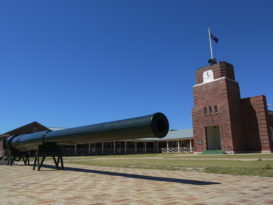 Oliver Hill military tour – You can visit Oliver Hill anytime you wish and have a look around and check out the big gun. However under the hill is a rabbit warren of tunnels. 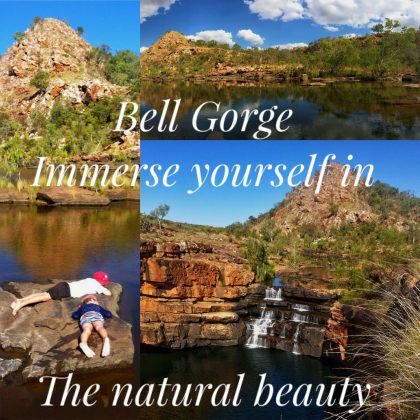 To check these out you must go with a guide – would be interesting. Golf & Mini Golf courses. 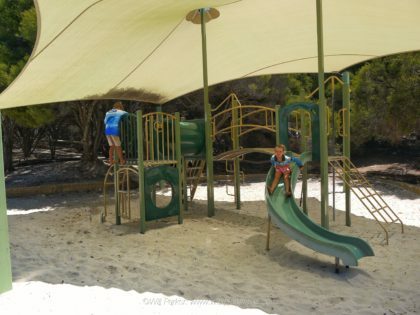 Rottnest Island is one big playground, however, should the need arise for a set of monkey bars and a slide the island has you covered. There are two playgrounds one is overlooking Thomson Bay, not far from the settlement precinct almost out front of the Dome café. This is the biggest of the two, is in view of the jetty where the ferries dock and is pretty well shaded. 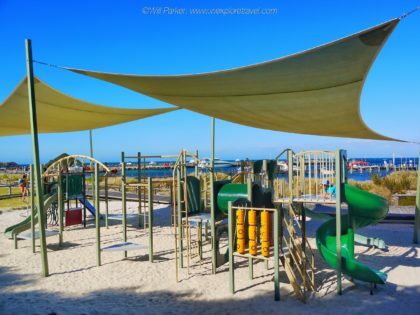 The other is at the Geordie Bay Café, this play area is fully fenced and you can watch the kids play from just about any table you sit at in the outdoor seating area of the café. 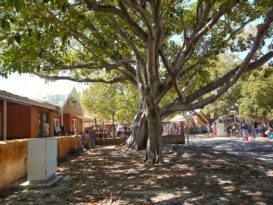 A great place for a pit stop as you explore the north side of the island. Playground overlooking Thomson Bay, near the Settlement. Playground at Geordie Bay Cafe. Whether you are coming for a day or a week the following list of eaterys you will more than likely find yourself in or be tempted by. General Store: This store is like an emporium, it has a bit of everything, from booze to snorkels and most food items in between. If you are staying a while you can pre-order your shopping and they will deliver it to your accommodation for you, it’s a great service. Top Tip: Although we found the prices to be reasonable (we are from Broome mind you) there are savings to be had by purchasing in Perth prior to arriving items such us, Shampoo & Conditioner sun cream, insect repellant, batteries, lip balm, moisturizing cream and deodorants. Top Tip: Bring your own water bottle as there are water bottle refill stations dotted between Geordie Bay and the Settlement and Kingston Barracks and the Settlement. There is no water on the west end of the island so be prepared. The Bakery & Simmo’s Ice Cream: These two just play on your weaknesses. Treats galore – temptation hard to ignore. There are three main offerings here, and the two little guys punch well above there weight and are well worth a try. Dome: is the biggest and offers a lot more than coffee, a good option for breakfast or brunch if you’re looking. The Lane: This was a happening little coffee joint. Good coffee, vibrant staff and yummy muffins. For what its worth it’s my pick. Geordie’s: Another nice little place for breakfast, brunch, lunch or coffee. The added bonus of playground. Even though we stayed on the island for seven days we did not eat out, choosing to self-cater. Having said that there are options. Around the settlement precinct, out about as far as the pub (Hotel Rottnest), down in front of the visitor centre and at a pinch to the Bathurst lighthouse. The WI-FI signal is strong to good. Geordie Bay Café also offers WI-FI, as does the Rottnest lodge to customers only. 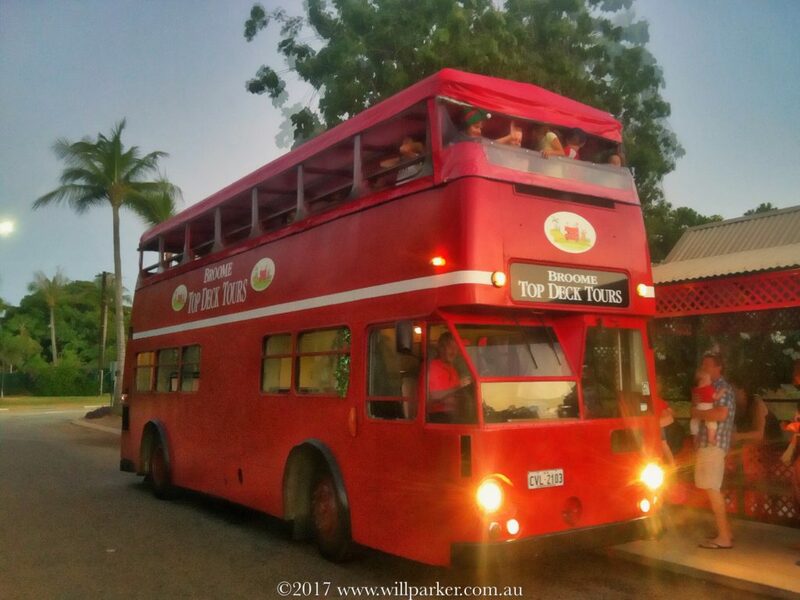 There are many islands that fringe the big island of Australia, there are many places in Australia that offer lots to the visitor. 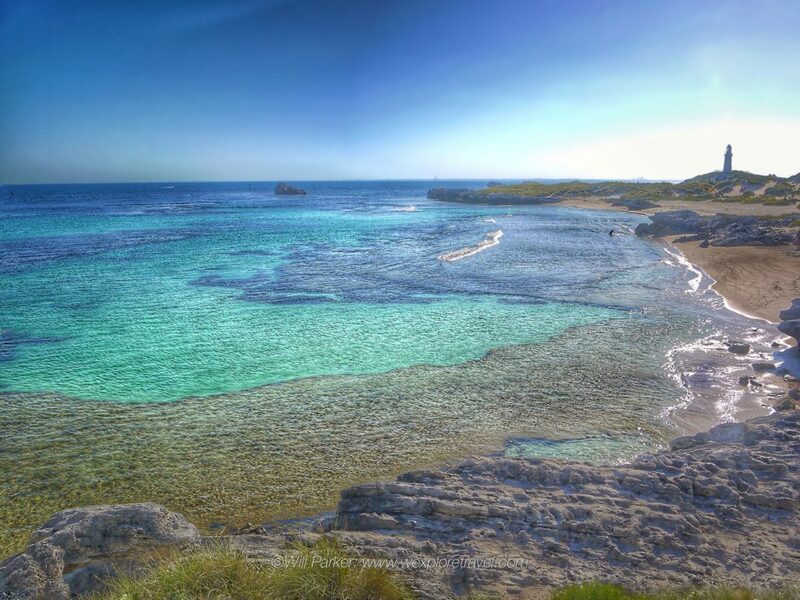 However, Rotto is right up there. It has beaches that are second to none, a little creature voted the happiest animal in the world, and history and heritage that for better or worse is none the less interesting and worth knowing about. 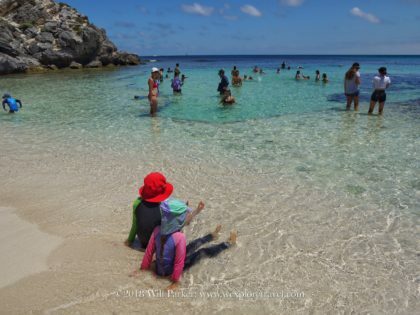 With more beaches and bays than you’ll ever go in one visit, 6,5000 years of history and just as many quokkas wanting to say Hi or have a selfie, Rottnest will enchant and spoil your senses from the moment you step off the boat and for the best part give you a great workout while its at it. In my own good time, on this beach I roam. 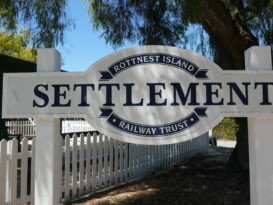 Have you been to Rottnest Island recently? Perhaps your planning a trip? Would love to hear from you.